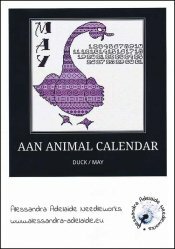 AAN Animal Calendar: May Duck [D6671] - $13.44 : Yarn Tree, Your wholesale source for cross stitch supplies. Cross stitch pattern by Alessandra Adelaide Needleworks. May features a duck in hues of purple. "May", is stitched down the left side of the design with the numbers stitched on the right side of the pattern. Stitch count 150w x 150h.